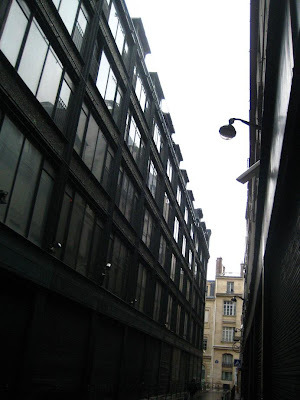 In the centre of Paris sits one of its most haunted spots. On one side, the bustling, commercial Rue de Rivoli, and on the other, the animation of the river Seine. Between the two, narrow, silent Rue Baillet and the ghosts of Christmas past, present and future. Ghosts of Christmas present. The buildings of La Samaritaine still stand firm, but like a ghost town in a Western film the inhabitants have all taken their horses and ridden away. The shutters are pulled firmly down, the locks rusting and the bottle green paint peeling and flaking to the ground. It is easy to imagine tumbleweeds rolling down this street and a loose wooden shutter creaking in the wind. There may even be a cowboy hidden away somewhere. Ghosts of Christmas past. Generations of shoppers pushed open these doors, climbed the iron staircases, admired the art nouveau fittings and filled bags with quality goods and quality presents. In Christmas present the gifts will come from elsewhere. The doors of La Samaritaine have now been closed for four years and will never open to shoppers again. Ghosts of Christmas past. These buildings are a gift from Ernest Cognacq. His first trading outlet was small change on the Rue de la Monnaie, but his vision was much grander. With his wife, Marie-Louise Jaÿ, Cognacq developed the structure, taking inspiration from the Bon Marché store on the left-bank, and built up a shop of departments, each individually owned and run. He plucked the name from a ghost, the Samaritaine fountain that used to sit on the neighbouring Pont Neuf. It became an immense success, the right solution at the right time, celebrated with a redevelopment in a fashionable Art Nouveau design by Frantz Jourdain between 1903 and 1907. Later, in 1933, Henri Sauvage added a river-facing Art Deco palace, a ten-story temple to shopping with a rooftop terrace and a restaurant with a view across the south of the city. Ghosts of Christmas past, ghosts of Christmas present. It is these architectural touches, listed as historical monuments in 1990, which have saved the structure from destruction or brutal redevelopment, but which perversely also led to the decline of the store. Ghosts of Christmas present, ghosts of Christmas yet to come. Along one side of the store runs the Rue de l’Arbre Sec. Legends tell us that this name refers to the dried wood of the hangman’s gibbet, and the association is apt here. 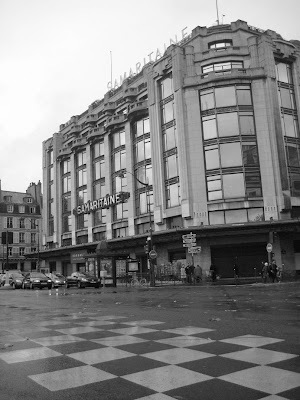 La Samaritaine was condemned to die by its owners LVMH in 2004. It had become too old and dangerous they said. An expensive and time-consuming refit would be necessary to make it fit the required norms, so wouldn’t it be better to hang it out to dry, let time pass and put the buildings to more profitable use. Ghosts of Christmas yet to come. In June 2008, LVMH submitted a plan to transform the store into office, small retail units, a hotel and a sprinkling of social housing - a spoonful of sugar to help the medicine go down. The city of Paris have accepted the plan, preferring life to this slow death, and the redevelopment should be complete in 2013. The cavernous, empty interiors will breathe again, but the ghosts will never go away. I remember being on the top floor last time I was in Paris about 12 years ago. Repurposing/preserving is a good thing. Nice looking structures! I wish to visit Paris some day! 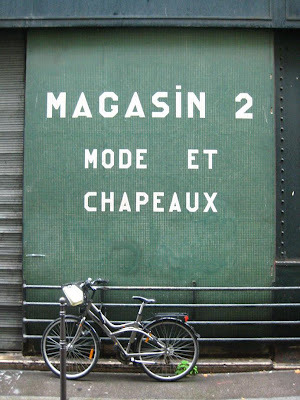 It was the only department store I ever liked in Paris. It has an atmosphere, a soul, something, the other ones lack. A fabulous department store that we all loved, for its architecture and for what you could find here (everything)! At least, the Seine facade is still under flood lights in the evening and will appear on most Pont Neuf photos! Given the changes in retailing over the years it's amazing that all the grand department stores of Christmases past aren't simply memories from long ago. But, how does a Bon Marche thrive while a La Samaritaine is shuttered? Perhaps bad management, and not historic designations. I'm glad I had a chance to visit while it was still a department store and buy some jeans that never quite fit. I still have them. Souvenir, I guess. I will always regret that I never made it to the rooftop cafe. Maybe the new people will re-open it? Seems it was a popular store then! I always found it a more pleasant experience than Galeries Lafayette or Printemps, but it was clear that it had been going downhill. Two of the units had already been sold off, and it had become barricaded in to the last remaining units. I guess the question is what will happen next. It's almost a dirty word today, but how will LVMH treat the 'heritage' of these units? 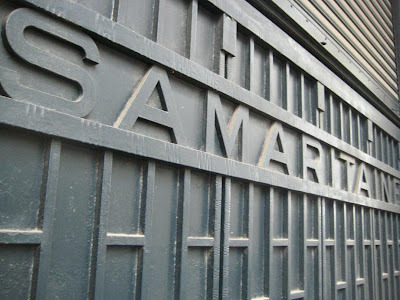 Will the hotel keep the Samaritaine name and logo, or will they try to make a break from the past. It would be a sensible idea to keep the rooftop terrace and restaurant too, and I suppose they will be obliged to keep a lot of the external decoration. It's going to be interesting to see the first project plans, and I imagine there will be much debate when they do appear! a couple of years ago I spent an afternoon photographing the minutiae along this ghost alley in case they will be removed or demolished in time for the new development...I love the green tiled walls with the names of the different departments spelled out in white!